For centuries, homemade bread and freshly baked products have been a symbol of Ukrainian family, the stable food family comfort and well-being. Today, it is hard to imagine baking without Lviv Yeast which makes homemade bread, buns and baked pastries very soft, fluffy and savoury. Enzym yeast products are extremely popular with Ukrainian bakers and are integral part of the country’s culinary arts. Ukrainian yeast is in great demand for home baking in many European countries of Poland, Germany, the Netherlands, the Czech Republic, Belgium, Slovakia, Slovenia, Croatia, Hungary, Bulgaria, Moldova, Romania, Bosnia and Herzegovina, etc. Enzym baking yeast comes in two forms – compressed yeast and active dry yeast. 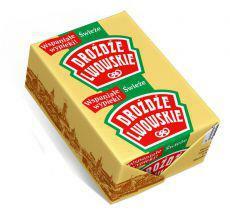 Baking yeast is available to Polish consumers as TM Drożdże Lwowskie in packages of 42g and 100g. Drożdże Lwowskie are available in one of Poland’s major supermarket chains. Yeast sold in 42g packages is very convenient to use since it has been adapted to most baking recipes. Compressed yeast is sold in the classic 100 g packages since it is the very popular and is most often used for baking bread and buns with traditional recipes of our mothers and grandmothers. Compressed yeast is a product that has stood the test of time. Nevertheless, the Company continues to improve on its quality indicators which allow consumers to spend less effort on baking products with complicated recipes. Compressed yeast can be stored for up to 35 days. During this period, it remains active and doesn’t lose its ability for dough rising. Dry Instant yeast is easier to use as it does not need to be dissolved in water at a certain temperature. It can be added to the flour directly. Dry Instant yeast is packaged for convenient storage and has shelf life of 18 months. Dry active yeast is sold in 12g and 100g packages. The best indicator for our high quality yeast is the delicious and flavour rich pastries and baked foods that are a highlight of any dinner table. ENZYM COMPANY – AN UNDISPUTED PLAYER IN THE EUROPEAN MARKET. The Company’s products under the Lvivski Drizhdzhi (Lviv Yeast) TM cover about 70% of demand in Ukrainian yeast market. In 2011, about 2.5 million tons of bread was produced using the Company’s yeast products. About 40% of the Company’s production is exported annually to the Netherlands, Belgium, Germany, the Czech Republic, Slovakia, Poland, Bulgaria and Moldova.